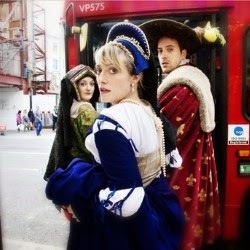 The year is 2014 and Edinburgh’s Pleasance Beneath is transformed into tourist attraction Hampton Court Palace for an hour, complete with actors playing historical characters in the very funny Mock Tudor, written & directed by Lily Bevan. Sam (Henry VIII), Jess (Anne Boleyn), Sophie (Kathryn of Aragon) and Nic (Wench) are actors re-creating the life and times of Henry VIII and trying to bring the palace to life for tourists, along with answering the tedious questions tourists tend to bring with them. Mock Tudor greets the audience with the actors ‘backstage’ in the palace, before a hard day’s work. It also just happens to be Sophie’s first day as Kathryn of Aragon, after transferring from the Palace Gift Shop which throws the actors (and their insecurities) into disarray. Add in an ambitious manager, seeking to ‘upgrade’ the visitor experience using technology and Google Glass, and you’ve got a decent story to keep you occupied for an hour. Sophie Bleasdale does great work as Jess, the stickler for historical accuracy as the re-enactments descend into chaos, as does Will Rastell as Sam (Imagine James Marsden doing an impression of James Mason via a Laurence Olivier acting workshop – hilarious). Emily Gilchrist does a brilliant job of playing the career-minded Nic, happily chewing scenery as if it will be her last meal. It is Lily Bevan as Sophie, however, who steals the show as the one-time gift shop girl who became Kathryn of Aragon overnight. One moment when she ‘forgets’ her lines resembles someone trying to climb an oily rope that someone has set alight – also hilarious. Somewhat disappointingly from a show that boasts no less than two designers, the set seems like it was thrown together, neither evoking a historical palace or a ‘backstage area’, but it succeeds in allowing the actors – or rather, the actors playing the actors – the opportunity to shine. Mock Tudor has an opportunity to say something really poignant about needlessly replacing human elements with technological wizardry but this is largely fumbled by the time it reaches the climax of the story. A lot of the dialogue is rapidly delivered, rarely giving Bevan’s (at times beautifully written) words an opportunity to land and strike the heartfelt blow you wish they would after spending such time & care creating full and round characters, but you almost forgive it thanks to the natural humour in the script and the performances. Watch out for more from Bevan. Great fun, though. And be sure to listen to the music on the way in, as it forms one of the stand-out hilarious moments of the show. Mock Tudor is on from Wednesday 30th July – Monday 25th August (except 11th), at 1.50pm in the Pleasance Beneath (Pleasance Courtyard).